We are now a little over 1/3 of the way through the legislative session and wanted to start giving regular updates of the work we have been doing. Before I get started though, one last chance to register for the Symposium tomorrow. Of course, you should also feel free to come and register (for free) on Tuesday. Ok, on to the legislative update. If you need catching up on the introduction of our 2018 agenda, please read this post. This bill looks to essentially eliminate the narrow road exception to the 3-foot law. Specifically, it makes legal the safe practice of crossing a double yellow when passing a cyclist. Bike Maryland testified on your behalf for both hearings on this proposal. At Senate hearing, the State Police submitted written testimony objecting to this bill. Specifically, they objected to the clause that allows for the motorist to cross the double yellow line when they deem it safe. This specific language has been problematic in other situations in court because if the motorist causes an accident the courts have ruled that they didn’t break the law because the law says that they are the sole arbiters of whether it was safe. In response to this, the sponsors submitted an amendment that exchanges this language for the language used in the law for right turn on red, requiring the motorist to yield before taking the action. At the hearing in the House the state police submitted no further objections and while this does guarantee they no longer object, we are optimistic that they will lift their objections. Requiring all state transportation agencies to adopt and comply with a complete streets policy. 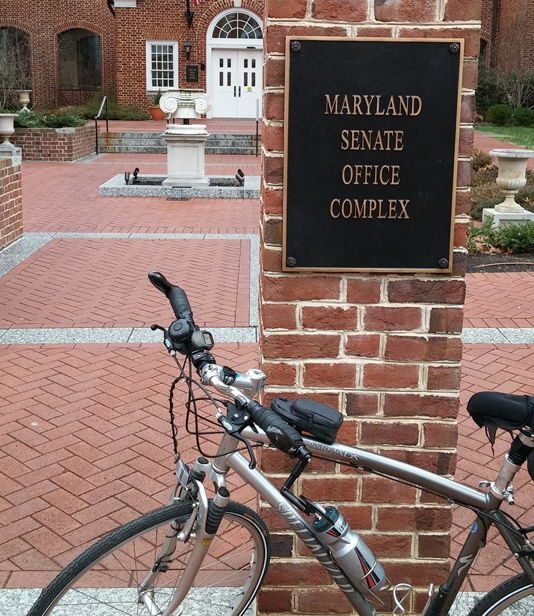 Bike Maryland will be testifying on your behalf at all four of the hearings below as well as coordinating the testimony of others supporting this position. This bill creates a program to provide assistance for local governments attempting to adopt a complete streets policy as well as assistance for design an implementation for local governments that have already adopted a complete streets policy. For more general information on VRU laws. There are other pieces of legislation that are important to us but not as high of a priority and a few issues we discussed earlier which are not legislative in nature, so more on all of those in the weeks to come. I hope to see you at the symposium tomorrow and as always, please email me joshua@bikemd.org with any thoughts or questions you might have.